This month’s ride was really a low key one with a soft start, lots of chatting, selfies galore at Christmas Hills followed by excellent coffee and service at the St Andrews General Store and a truncated return via the St Andrews – Kangaroo Ground Road after the coffee. For those with the time we had a BBQ picnic lunch at Pigeon Bank Creek. 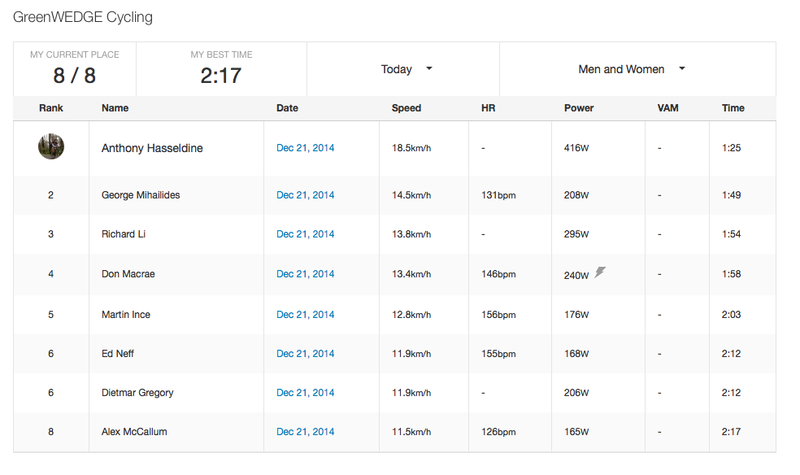 Anthony smashed everyone on the KOM segment of the ride la belle vue du Clintons today. Although the personal KOM of the day was Don’s ride up Pigeon Bank Lane! A great day. Open Letter to Nillumbik Mayor Michael Young. Re: Cyclists on Heidelberg-Kinglake Road. Alain has put together a strong argument to counter ill-informed comment on the use of the Kinglake Road climb by cyclists. While its not really a Ride Report it is part of our journey and may long it continue to be so. Click here to read his open letter to the local mayor. 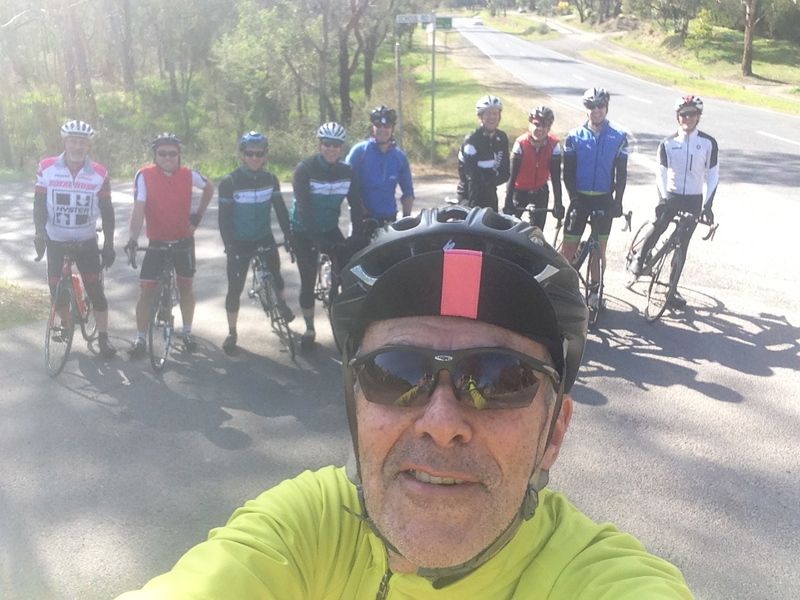 Last Sunday’s ride was a “look and see” at two Everest ride locations recently successfully completed by Loc on Mine Road, Nutfield and the other on Melbourne Hill Road, Warrandyte by Stryder. 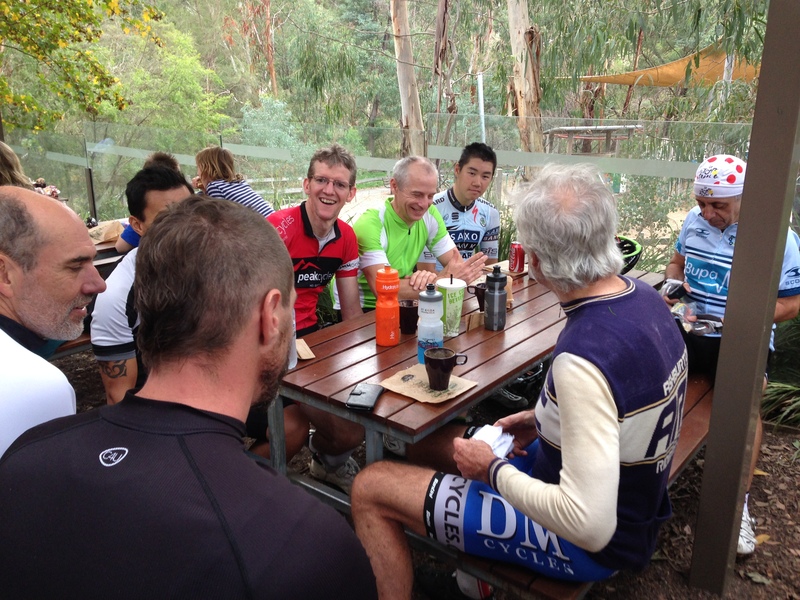 We met up and finished at The Bakery in Warrandyte and overall about a dozen riders hit the road for the tour for the cross Yarra ride. One or two riders missed the pick up points and rode somewhere close behind. One got a bit geographically misplaced but we eventually met up. We took a few less travelled roads through the GreenWEDGE and did a couple of hills like Research Road doing it the hard way, i.e. turning left after crossing the Warrandyte Bridge and riding straight up. There were a few groans but when we hit #90 Research Road there was a great feeling of accomplishment writ large across the GreenWEDGE Cyclists faces. We pushed on to Kangaroo Ground and down to Wattle Glen taking the back way to Nutfield via the twisty climb, Wilson Road, a road not ridden before by many of the riders. It was then on to Broad Gully Road to Nutfield and Mine Road. Loc talked us through his awesome Everesting ride, the start, the hundreds of repeats, the light and darkness, the pain and injuries. Locys Lane I’ll be calling it now. 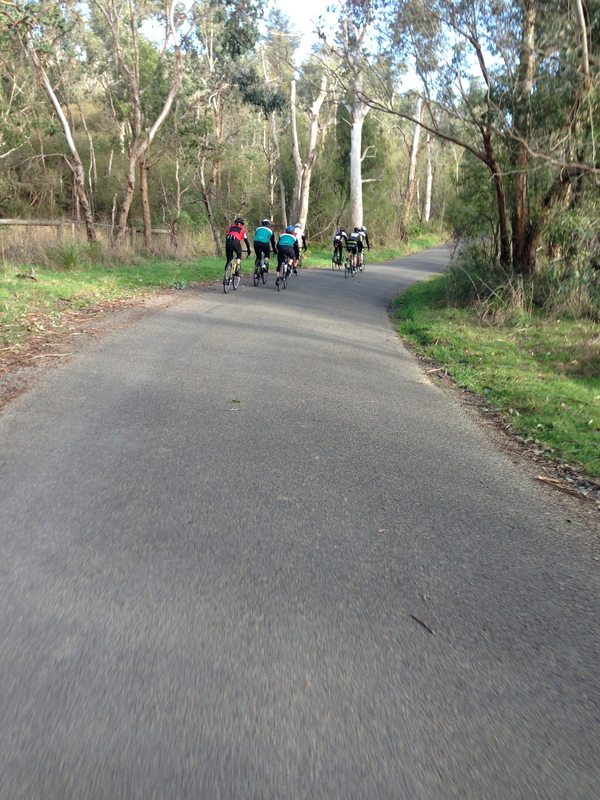 It was then onto to Church Road and back to Warrandyte on the Kangaroo Ground-St Andrews Rd. Cyril did a fantastic job as the lead-out man leading the train back safely to Warrandyte before pacing up Melbourne Hill Road where Stryder conquered his second Everest. From there it was a short ride through The Park and weaving down Husseys to Warrandyte South and back to The Bakery for a bit of banter and a recounting of our mornings’ cycling exploits. It must have been an impressionist piece of cycling because this weekend George is going to attempt an Everest of his own as well as raise funds for the homeless. Details on the GreenWEDGE Cycling discussion page or here on his fundraising page. Thanks all for riding the GreenWEDGE in May, very enjoyable. 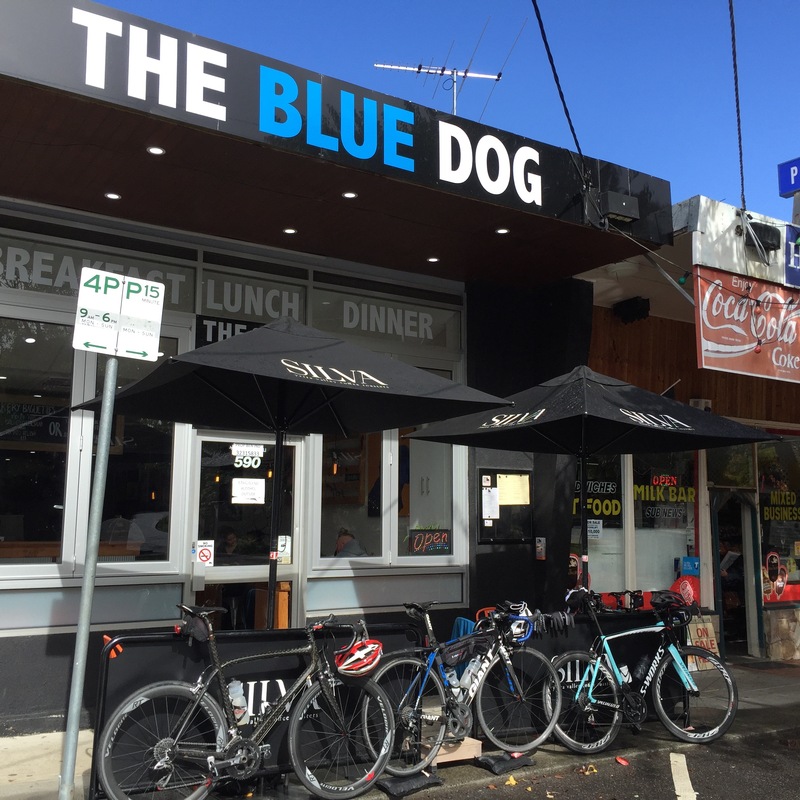 See you on the next GWC ride in June or if you want another ride soon there’s a papa bear cafe ride this Saturday, May 24 at 7:30 from Eltham to Healesville and return. Last Saturday’s GreenWEDGE Cycling ride went very well considering that it was Easter and the weather on the morning was bleak at best. I didn’t think anyone would show up as I rode from North Warrandyte in heavy rain. I was wrong, Ed was there and soon after Andrew and Cyril. Along came George and Jack followed by James M. We didn’t do Yarra Glen – Clintons rather we went straight along the St Andrews Road by Smiths Gully and up SCHOOL. 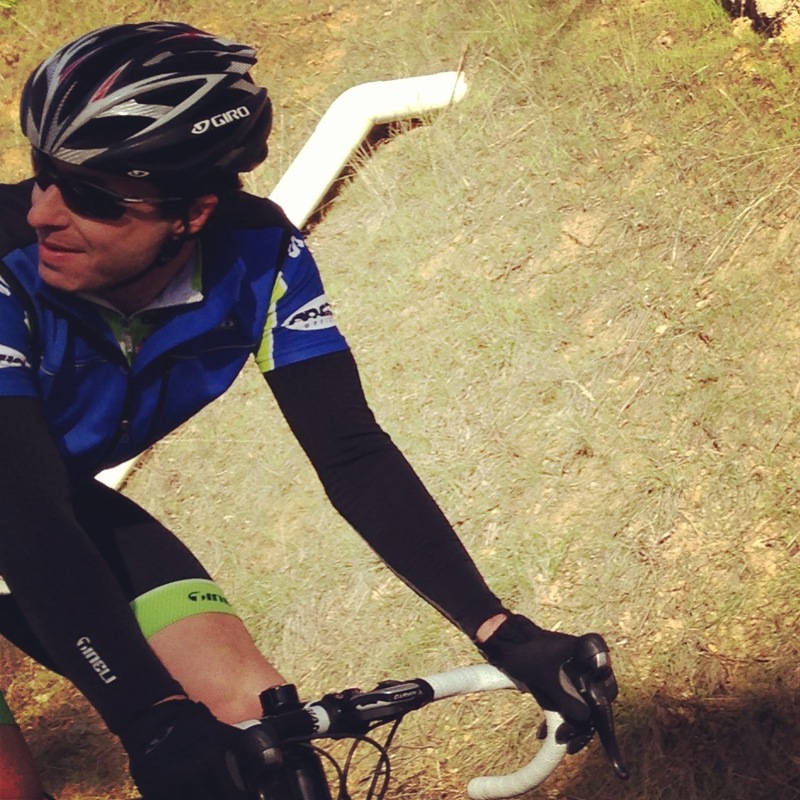 Andrew North got the KOM de Jour setting a time of 7:14 using the School Road (unpaved) segment. Well done Andrew. It was an excellent ride, with a heavy duty KOM and meeting a couple of new GWC riders, George and Jack who rode from Mill Park and Morang South to join us on a bad day weatherise. Both have connections to other GWC riders including Alain. Thanks Andrew, Cyril, Ed, Jack, James, George and James Stratford for coming along later. This is the actual ride and done by Ed. Today we had three rides on offer. A short, a long or both together. 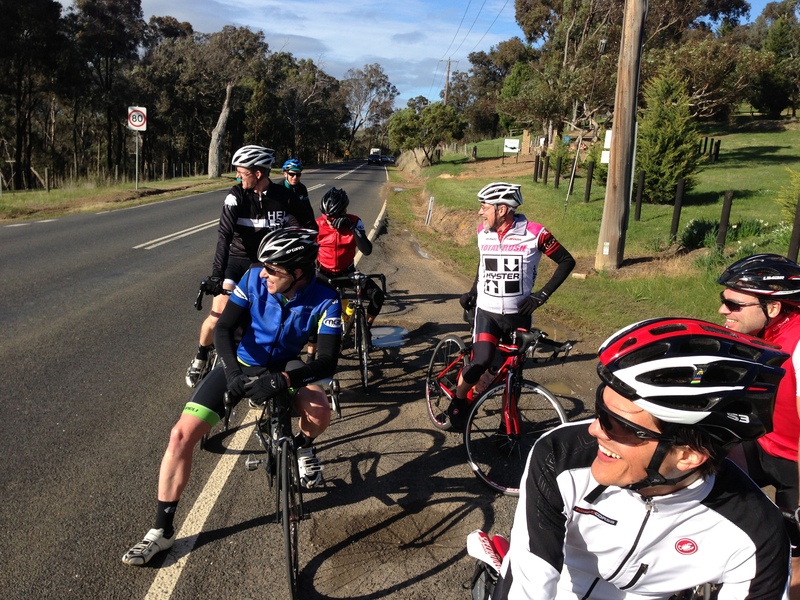 Today Alain, Alex, Cyril, Dale, Dietmar, Don S, Don M, Ed, Marty, Jeremy and Sean turned out to ride the Christmas Ride. Meeting up at Kangaroo Ground and doing the first ride which was a loop to Smiths Gully, down Clintons to the Yarra Glen road and back to KG. The second ride was also from KG but this time turning down to Wattle Glen and out the Wilson Road to Doctors Gully Road and on to Strathewen and back to St Andrews via the Hindlebrand to St Andrews. That’s where we caught up with partners, friends and children at a Boy Named Sue for lunch. Thanks James for making the booking and reserving a great table for us. 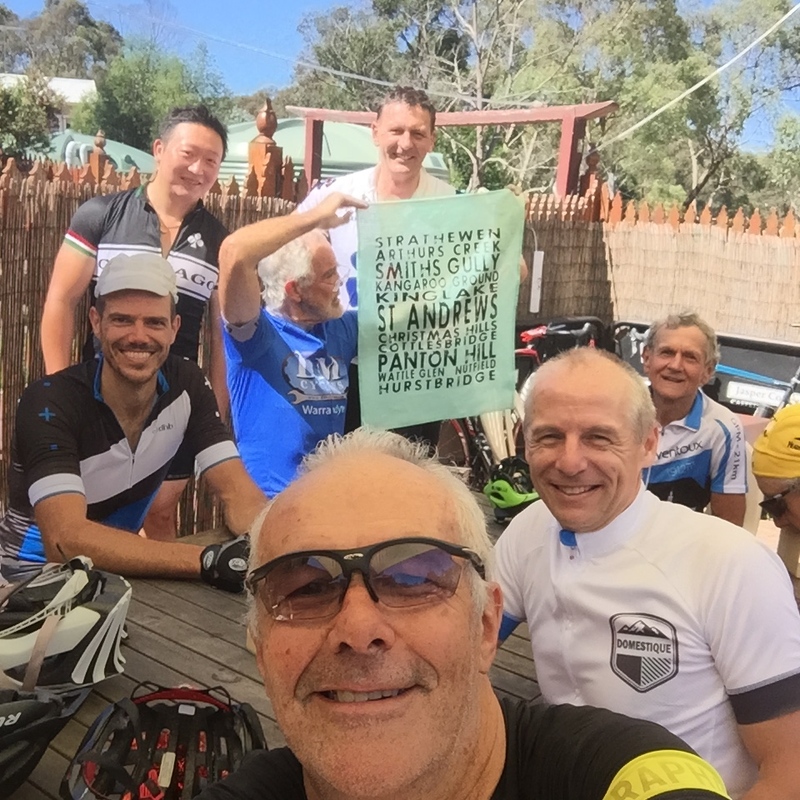 The Balade du Mois (Ride of the Month), #NotATB, got underway from the Warrandyte Bakery at 8:30AM with 7 riders, Alain, Alex, Cyril, Dietmar, Don M, Marty and Sean. Cyril the Captain devised the ride and did the very good Strava map which includes an excellent cue sheet. Our only deviation was to take Pigeon Bank Lane/Menzies Road rather than going through Kangaroo Ground. The other change of plans was when Alex and Dietmar got a bit ahead of themselves and missed the turn up the Cottlesbridge Road to Greens Road and into Arthurs Creek. After doubling back the two musketeers met the rest of the crew in Nutfield and headed back the way they came. After that it was up to Flatrock and through KG to Eltham, up Mount Pleasant and on to the Warrandyte Bakery for coffee and in some cases sausage rolls. The timing was perfect arriving at Panton at exactly 9:20AM and finishing with 3 spare minutes at The Bakery at 11:27AM. The weather was windy and hot but ride was great. Thanks to Cyril for the ride planning. 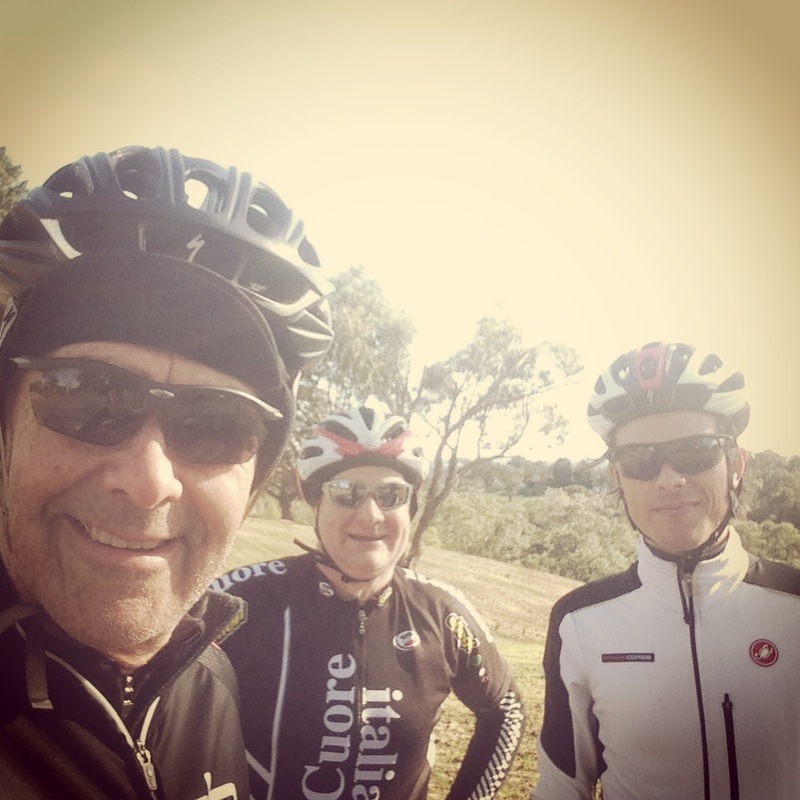 Comment on Cyril’s Strava “Andrew Stalder ……. Congrats to the riders who took on Amy’s Gran Fondo yesterday. Looks like it was a beautiful day for it! Our scheduled ride, despite having four riders, didn’t quite turn out as intended. One rider had a mechanical issue which forced his abandonment, two had to return early for family, and in addition to being Vuelta-weary I somehow managed to strain my ankle and opted to rest it. 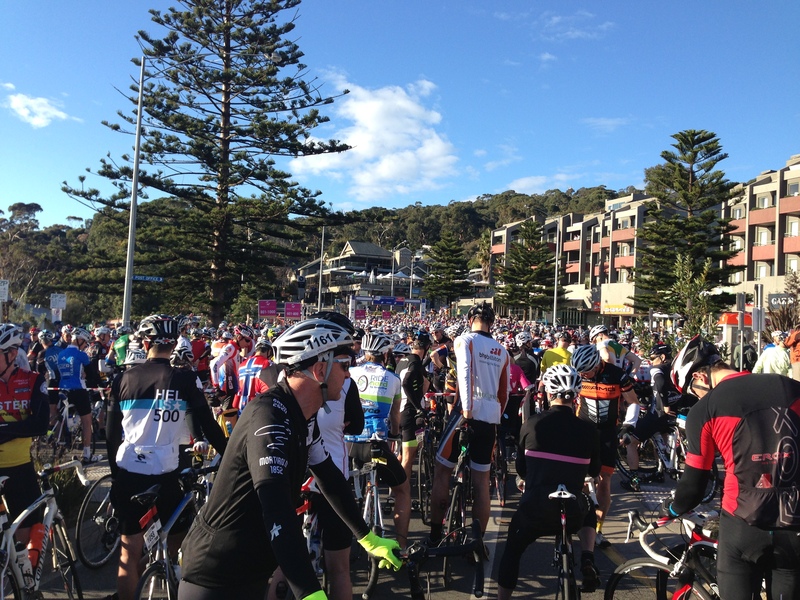 As Alain said lots of the GWCyclists were down at Lorne doing the Fondo. It was a beautiful morning and whole street filled with the colour of lycra jerseys. Many of the riders had done it before, others were new to the ride, all were talkative and nervous as the clock ticked towards 8:00AM. In waves and under the tapes they rode onto the neutral zone, over the timing mat and off down the Great Ocean Road to Skenes Creek. I rode straight through to the finish line trying to pick a few minutes up by not getting off the bike. I lost 6 minutes on my 2012 ride between Barramunga and the finish line. My highlights were, sitting on a DRAPAC rider for 10 KM on the GOR ( I should have learn’t the lesson from him about riding steady but deliberately) and the other highlight was the descent to Lorne from Mt Benwerrin after the finish point was reached. Brilliant Day, thanks Amy. A considerable north to north-westerly wind, relatively warm temperatures and the virtual absence of rain created generally fair conditions for cycling. Alain, Alex, Bruce, Cyril, Daniel, Fletch, Jeremy, Peter, Ron and Sean were in attendance to take advantage of the weather. After an orderly and punctual roll-out around 9:05am, the tailwind provided a nice assist to keep the pace up on the first south-bound section from Smith Gully down to Kangaroo Ground War Memorial tower. With a regroup unnecessary, we continued over the hill and down through the Garden Hill sweeper. The crosswind was in full effect next to the KG cemetery and provided a few interesting moments down this very exposed part of the descent. Reaching the bottom of the turn-off to Dawson’s Road, it was commented that we were now “off the beaten track”. A fair measure of spinning /grinding delivered us back up to St Andrews Road and some elevation earned to use on a good descent. Flat Rock Road delivered with its nice “roller coaster” run along the ridge, finishing off with an extended drop to the finale which was the first of two real “smile on your dial” descents of the day. 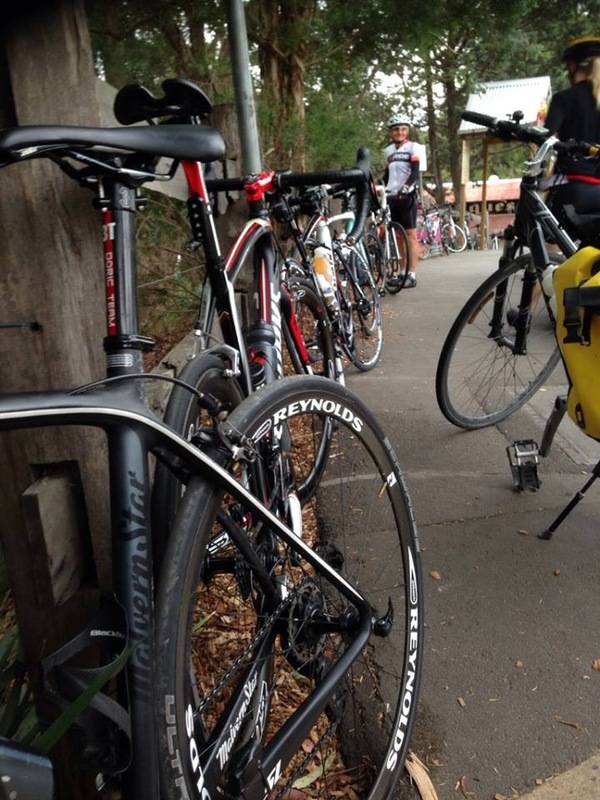 A short transit through Hurstbridge delivered us to the start of the Bridge to Bridge segment. It was nice of two cyclists to wave our bunch through the roundabout even though they were in the intersection and they had right of way. At the one lane bridge, good road etiquette was shown by the bunch despite being split up. The Hurstbridge to Arthurs Creek section was largely protected from the wind due to being in a little valley, and this provided some relaxed riding along a nice winding section of road and a good chance for further socializing. The climb up towards Yan Yean from Arthurs Creek was partially sheltered from the wind. A number of passing motorcyclists provided a soundtrack of sorts to accompany our burning quads at this stage. A quick regroup at the top and it was now time to brave the next exposed crosswind section of the day. Alex came charging past some back markers after setting off, putting down the power, and descending quickly despite the considerable crosswind. A bit more spinning up the hill delivered us to the turn at Yan Yean with a slight tailwind giving us a hand up the hill. All keen to hit the accelerator with the downhill run and tailwind behind us, the group sped up and hit 50-60 kmph on the way down to Doreen. Turning the corner towards Nutfield, the group carried on with the pace and more tailwind, enjoying some fast meandering gully roads – just what the Doctor ordered! Mine Road offered a “table top” profile of segment with steep ascent, ridge run and steep descent. Alain and Fletch led out quickly with sniff of a KOM opportunity in the prevailing conditions for the descent. Alain bagged his KOM (click here) with some great descending, despite a car driving up during the fastest section of the segment. Regrouping at the bottom, many smiles were seen on the riders’ faces. Once the group photo was taken (complete with traditional Alex selfie in the foreground! ), it was on to the final hill up and out of St Andrews. 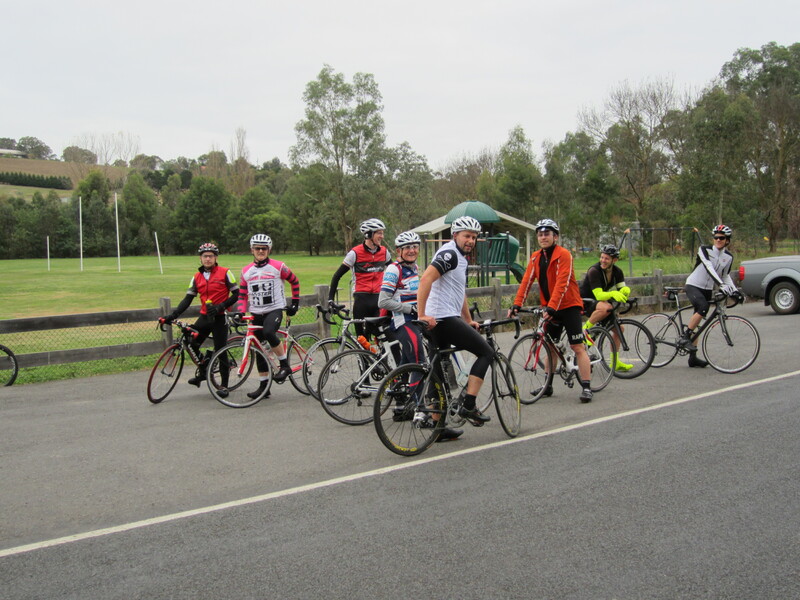 On most rides returning from Kinglake and further afield, this hill can be a challenge and drag on a bit; however, with a tailwind and buoyed by a great day out riding, the group cruised up the hill without too much drama. Mechanical issue- and puncture-free, the Laterne Rouge had an easy day of it, but had still earned his coffee and lunch at the Smiths Gully shop at the close of the ride. Thanks to all those who contributed to the day, and see you out there next time! The July Ride was a short one with a slightly shallower profile than the usual rides. 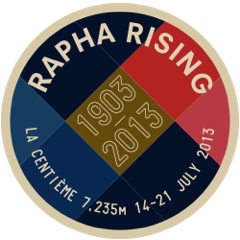 It came at the tail end of the Strava Rapha Rising: La Centième (click here). The idea was to have a wind-down following the challenge by cycling the gentler Paradis du Nord (click here). However, a few riders couldn’t help winding up towards the end of that course. The peloton split and the breakaway, led by Cyril, shot off for lots of vertical metres. The peloton (Peter and Alex) held its nerve and eventually launched its missile. 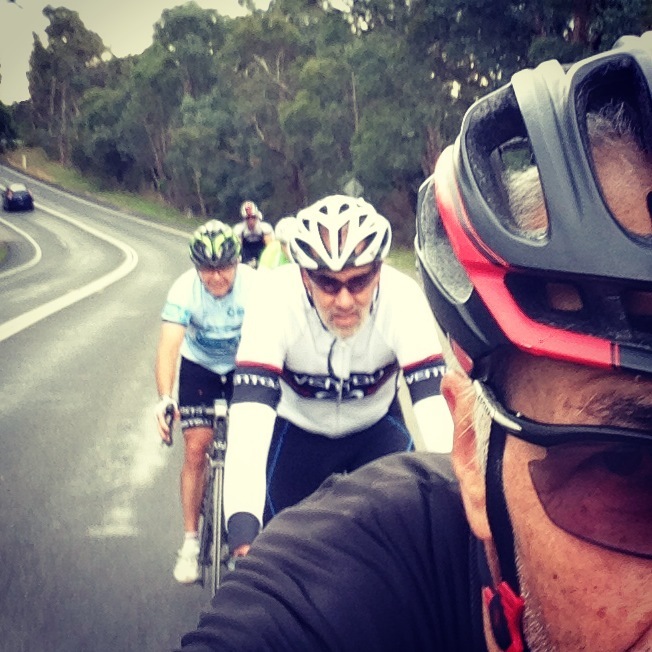 Alain rode away into the Kinglake Ranges (163km for the day)(click here) to add a whisker short of 3,000vm to his challenge total. He completed the week with 19,310vm. 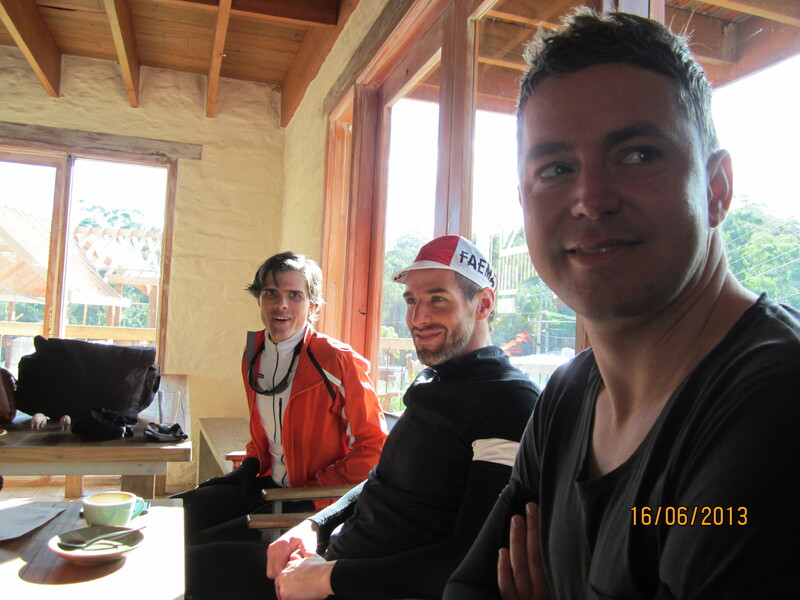 The domestiques were happy to finish after 44km and 760vm and have a coffee at the Wombat Café in Hursty. Meanwhile, Cyril’s breakaway had headed up from the Bakery onto the Warrandyte Circle of Death, (click here) taking every steep road imaginable in the area. These included Harris Gully, Houghton, Mt Pleasant, Pigeon Bank and a host of others to climb over 1300vm in only 55km. Well done! Thanks to Alain and Peter for persuading me that the Hildebrand and School roads were passable. That was the unexpected and brilliant section of the ride. The views of the distant mountains must have inspired Alain to push on to tackle a repeat of our ride and then Kinglake. An exceptional morning’s riding! 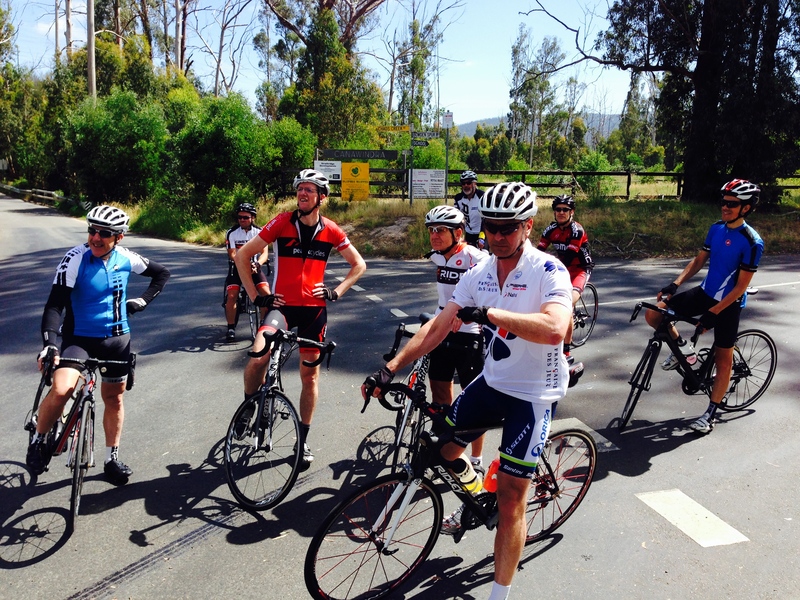 I class the Paradis du Nord loop and the Warrandyte Circle of Death as GreenWEDGE Cycling’s hallmark rides. With the announcement of the 2013 Rapha Rising challenge on Strava, it was inevitable that GreenWEDGE Cycling would come up with a special response. 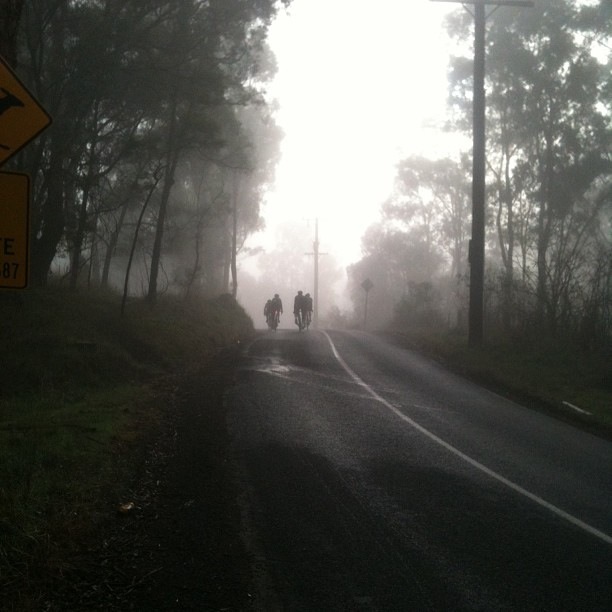 ‘Storming the Kinglake Bastille’ became our plan. 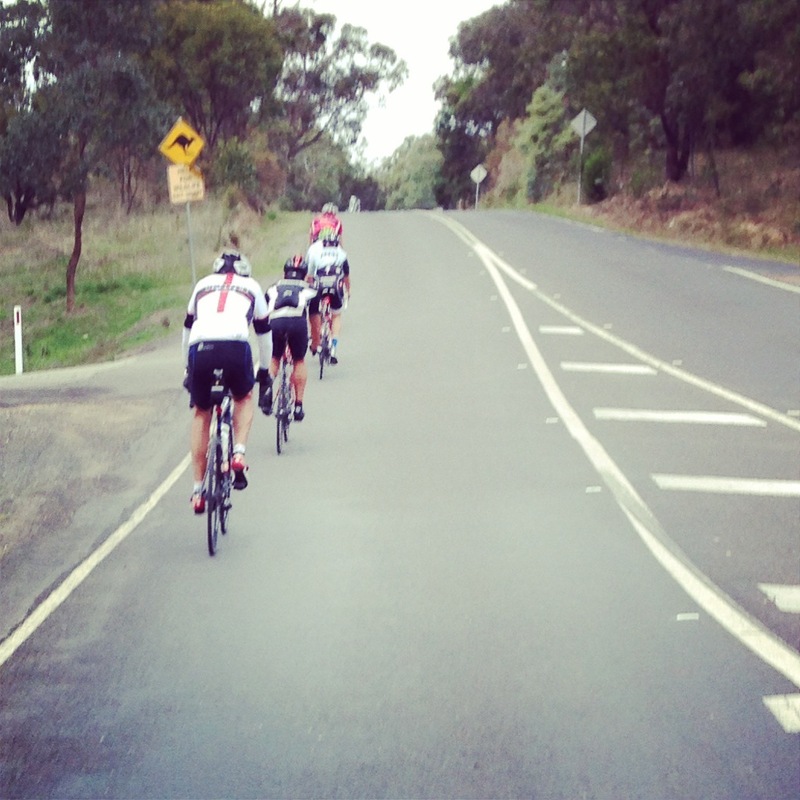 The climb into Kinglake from St Andrews, first undertaken by cyclists in 1883, is one of Melbourne’s most iconic rides. But our plan called for something more. To mark Bastille Day, the first day of Rapha Rising, and the day which would see the Tour de France ascend the famous Mt Ventoux, we would climb into Kinglake from four directions: St Andrews to the south, Humevale to the west, Glenburn Road to the north and Mt Slide to the east. In each instance we would ascend to the highest point of Kinglake at Frank Thompson Reserve. If we pulled it off we would be covering over 170km and racking up at least 3500 vertical metres. But as luck would have it, as Bastille Day grew nearer, the weather forecast worsened. Then the day before the ride, Alex, who had come up with the idea, crashed and had to pull out. After a night of near constant rain, a number of others cancelled too. But with rule #9 in mind, Alain, Blake, and Jeremy left Kangaroo Ground, with a send off from Alex, just after 7:30 on July 14. Black clouds were gathering over the Kinglake Ranges as we warmed up with an ascent of Dawson Rd, a descent of Alma Rd and then the picturesque Clintons Rd climb. But we hadn’t anticipated what awaited us.We moved on to the first major climb of the day from St Andrews to Kinglake and near the top, the weather closed in around us. By the time we passed the highpoint of the Ranges and began the descent to Pheasant Creek we were being lashed by steady rain and a fierce, gusting, northerly cross wind. Descending into Humevale our hands had frozen, our feet were saturated and our glasses had become useless. Our spirits were pretty low, but the sun hinted at breaking through over Humevale so we resolved to keep going, at least back up to Kinglake where we could make a go / no go decision. We soon realised the weather system we had fought through before was sitting on top of the Range and showing no sign of abating. At lower altitudes it wasn’t even raining but on the Whittlesea-Kinglake Rd we were being soaked again and struggling to keep our bikes in a straight line against the cross wind. The scariest moment came as we descended from the highest point of Kinglake, just west of the shops. Huge gusts struck us on the hill, putting our bike handling skills to the test. Blake caught the worst of it and was pushed right across into the oncoming lane – incredibly, as this happened an impatient motorist sped through, undertaking him! We resolved not to go back up the hill – the cross winds were just too dangerous. But we also realised we were essentially halfway towards accomplishing the plan. Jeremy pointed out that we could exclude an assumed path along the Melba Highway and simply descend and then climb Glenburn Road before doing the same on Healesville-Kinglake Rd to Mount Slide (at the corner with the Melba Highway). We’d stay true to the spirit of the original idea, if not to the letter. We proceeded on Glenburn Rd and again the weather improved momentarily at lower altitude, but when we returned to Kinglake the rain was harder than ever. Still, with three of four climbs done we could hardly end the ride so we pushed on down to Mt Slide. 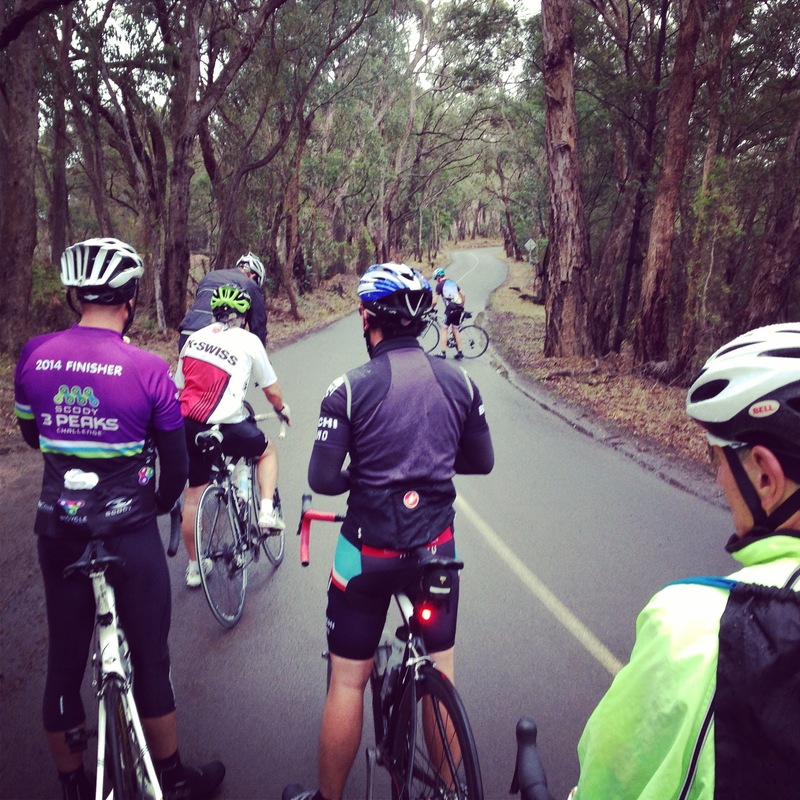 Descending along the Healesville – Kinglake Rd the sound of the wind roaring through the forest was deafening. A momentary rainbow forming over the lowlands to our south offered the hint of some respite but there was still more struggling to come. On the last ascent, passing motorists showed more hostility than sympathy to the sight of three wet and tired riders. In fact, some of the worst road sharing we’d ever seen added an additionally frightening challenge to the elements (and that’s putting it really nicely). We became separated too, before reaching Kinglake. All day we’d had at least two of three together on the climbs, maintaining the semblance of a group. But on this last climb that unity broke down as we each ground out whatever rhythm could keep us going through the rain and wind. We regrouped at Kinglake and paused to eat some bread from the bakery but stopping also made us horribly cold, so we quickly began our descent off the Range. Leaving the bad weather behind us, we stuck together through Smiths Gully and Panton Hill, maintaining a good pace considering the distance in our legs and everything else that had gone before. Outside the Panton Hill hotel we could see a group warming themselves around a fire. We got some funny looks as Alain called out, ‘that looks so good!’ The suffering of the ride had reduced us to primitive impulses, awed by fire as we pushed on through the final tired kilometres. But we could take satisfaction from our fatigue: we’d made it through some very discouraging conditions to complete the essence of our original plan. 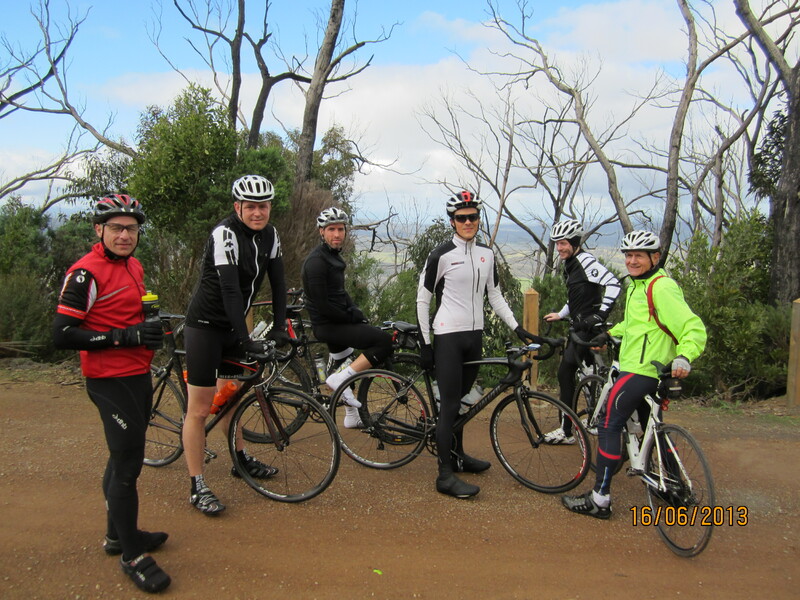 This month’s ride took Alain, Alex, Benny, Blake, Ed, Martin, James and Simon up into the Kinglake Ranges via Whittlesea and Humevale. It was a foggy start but it soon cleared with a spectacular view across to the ranges from the Kangaroo Ground Memorial Tower hill. From there it was down to and up Alma Road and down to Hurstbridge with more fog shrouding the riders out to Arthurs Creek where the sun blasted away the remaining fog. James Stratford took this fabulous photo on the way out to Arthurs Creek. The long and steady climb up Humevale Rd was a highlight of the ride. The fast riders smashed their way up the climb, the rest of us taking it a bit easier at our pace. The weather up on the range was much colder than down on the plains below. Once at the top, it was out to Pheasant Creek and the turn-off to Mt Sugarloaf which was for most of us was an untried road. Alain had done it a few weeks ago and we were keen to ride it too. Once back from there we dashed to Kinglake and the descent to St Andrews in order to be at A Boy Named Sue for our lunch booking – and were we hungry! Every variety of coffee was ordered including the MAGIC version, something I’ve never heard of, but Benny was well versed in. Some of the bunch fitted their bikes to cars to drive home from A Boy Named Sue, others rode home. A top day and we were very lucky with the weather too. Overcast skies greeted the start of the inaugural GreenWEDGE bike ride on May 26 2013. For the cyclists who had been planning this event over the preceding weeks, however, poor weather would be no deterrent. At 9am our group of nine riders set out from Kangaroo Ground, for the first leg of our ride – up the ramp past the Kangaroo Ground Tower, and down Garden Hill to Dawson Rd. Whilst the Dawson Road climb averages only 4% overall, some steeper sections with spot elevation approaching 20% make the climb more challenging than it might seem on paper. After a speedy descent of Flat Rock Rd, the group proceeded through Hurstbridge and past rolling fields towards Arthurs Creek. In the morning stillness – punctuated only by the whir of freehubs and the occasional tweets of grass parrots – it was easy to appreciate how special our area is, and how great it is for cycling. Past the watchful gaze of herd-guarding alpacas, we ascended Nankervis Rd and pressed on towards Strathewen. At Strathewen the group ascended past the school – a climb with an average 13% gradient. A steeper climb was to follow, and as we made our way back out from Stathewen, under passing light rain, the daunting Hewitts Rd ramp awaited. 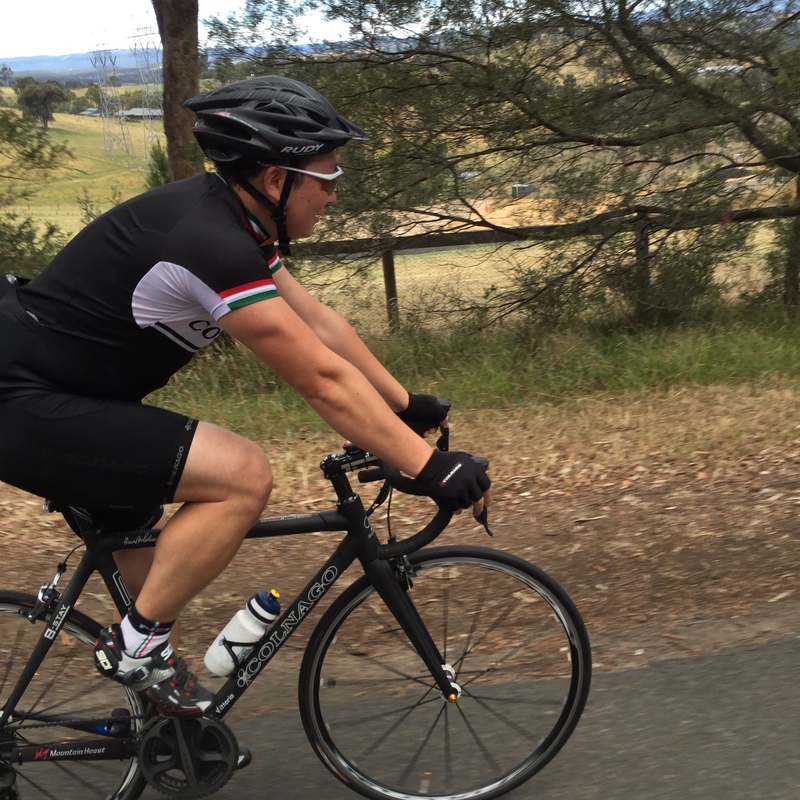 With an initial gradient exceeding 20% it was a hard slog up the hill, but the effort was rewarded with a fast descent from the top down to Heidelberg – Kinglake Rd. The last short leg down to St Andrews saw some playful attacks, all in the spirit of a fun group ride, before we reached our lunch stop. All agreed it was a successful first ride for the group, and that it had been great to meet other cyclists from the GreenWEDGE! “GreenEDGE Cycling’s first ride together was on May 26 and we rode out to Strathewen via Arthurs Creek and back to St Andrews for lunch at A Boy Named Sue. There were 9 of us in the first ride from left to right Martin, Dale, Cyril, Ed, James, James, Aaron and Alain. The loop from KG was exactly 55KM and the elapsed time for me was 6:01:05 – that was a very long and enjoyable lunch. Here’s my Strava of the ride”. Great Stuff Alain, it was very enjoyable and great to be out, part of the original 9! I think it’s safe to say we all had a ball, can’t wait to do it again !